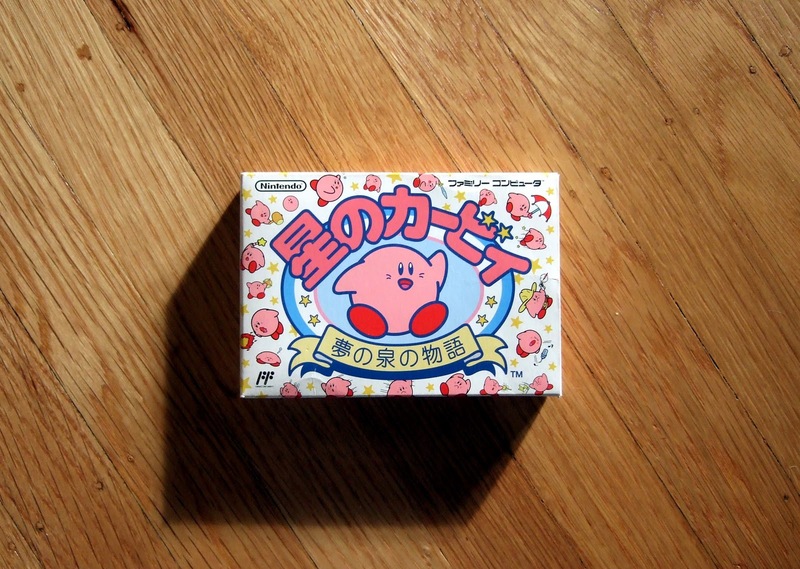 ... a beautifully boxed copy of the Famicom version of Kirby's Adventure (known as Hoshi no Kirby: Yume no Izumi no Monogatari in Japan, which translates to something like Kirby of the Stars: Story of the Fountain of Dreams in English). Honestly, I've never been all that interested in this game, although I couldn't tell you why. I'm guessing it's because it came out after the SNES was released; by then, my mind had moved on to 16-bit games like F-Zero, Final Fantasy II and Super Mario World. That all changed, though, after playing Kirby's Return to Dream Land, which I enjoyed so much that I decided I just had to own the series' first console outing, too. So, I bought the copy seen in the photos below through eBay. Anyway, I'm having such a blast with Hoshi no Kirby: Yume no Izumi no Monogatari--expect to hear more about that in an upcoming post--that I've already hit myself over the head a number of times (with one of those giant squeaky hammers) for passing on this magnificent platformer back when it was first released. Oh, well, all that really matters is that I'm playing and enjoying it now, right? By the way, if you'd like to see a few more photos of this game's beautiful box and cart, please check out my Flickr photostream at your earliest convenience. That Kirby is so awkward and adorable. I can't believe you'd never played this one. It's one of my favorite NES games of all time, and for sure my favorite Kirby game. Ooooooooooh myyy! 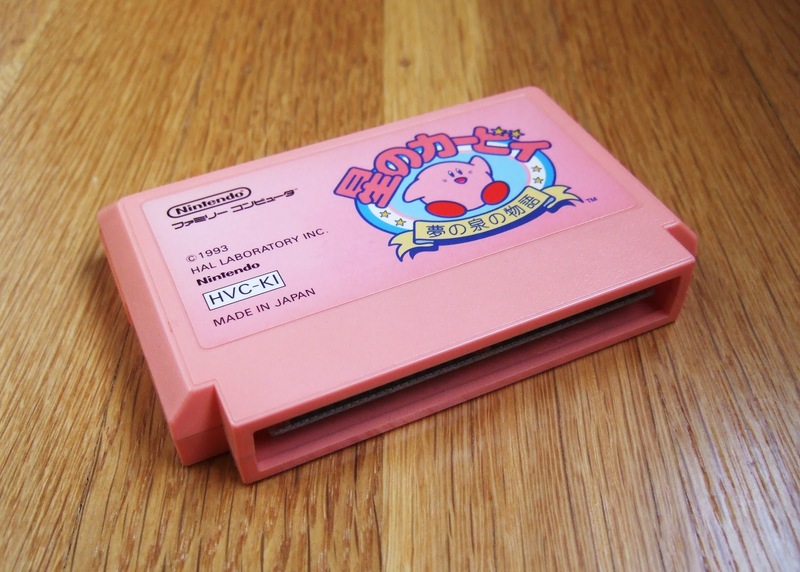 The cartridge is pink!!! I did not know that! So amazingly beautiful. I agree with Justin, this is one of my top NES games ever. I've got to get this for my collection! I just have the american grey version. Hmpf! Yeah, I know it's weird, Justin. It just didn't appeal to me before I played Kirby's Return the Dream Land for some reason. I'm loving it now, though! That's great, Kimimi! How great that both you and your son love this game :) That said, you really need to get yourself some more Famicom games! Hey there, Linnea! Yeah, it is as pink as can be. I love it! Sorry I haven't posted the rest of the photos to Flickr yet. Will do that shortly, I promise. Um... this is probably the cutest game related thing I've seen in a long time! Love it when you share stuff like this! Pink cartridge! I want one now! The west got such boring cartridges for the NES. Glad you got a kick out of this one, Matthew! And, yes, it is pretty darn cute, isn't it? For a total sweet attack, check out my Flickr photostream for three more photos of this game's box and cart. Sorry it took me so long to post them, by the way! I love Kirby too. I don`t have a boxed copy though, that looks really great! Ah, I was wondering what you thought of this game, Sean. Glad to hear you like it, too :) Merry Christmas to you and your wife, by the way! I loved Kirby's Adventure on NES, I had it back in the early 90's when it first came out. Hey there, Adam! Seems I'm one of the few who ignored this game when it was new. As for the GBA remake: I'll definitely be hunting down a copy of it soon, as I'm really enjoying the Famicom/NES original! Do you like the GBA remake, by the way? Hey there, Mark! That's a great story -- especially that you play through it at least once a year. I can see myself doing the same from now on, as the game is soooooo cute! Also, addictive. I love just trying out all of the different skills :) Oh, and, yes, the music is SUPERB! I feel I should mention that there's a 3D Classics version in the eShop. Although the actual version of the game depends on the region you purchased your system. Fun game! Absolutely love it! You'll enjoy it!